One might consider it difficult to reprogram oneself to think critically about fashion after the summer we survived. The destructiveness of the Trump administration is disembowelling any semblance of national pride in America; globally, white nationalism is on the rise, with neo-Nazi groups more visible than ever; the Islamic State are claiming responsibility for the many terrorist attacks that are reported every other day. The sociopolitical turmoil the world is enduring is important to address and fashion week rightfully takes the backseat. However, one must continue to offer reportage on the happenings for they are the impetus of this website. The most difficult challenge a critic faces is whether to criticise brands for overt political messaging—oftentimes it is diluted by insipid sloganeering—or to lambast those that don’t engage with politics remotely. It is a double-edged sword, engagement or no engagement. I believe, for fashion to move forward it is necessary to have both: those who engage, those who don’t. 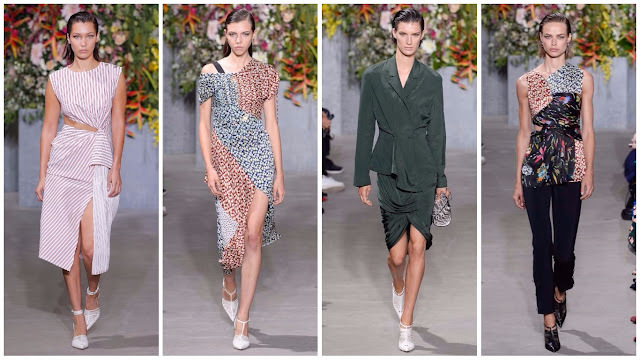 Jason Wu, on Friday, was a world removed from politics. At the South Street Sea Port, the show space was decorated with colourful floral arrangement suited to the spring season. His clothing was more relaxed than usual, a confident departure from his days creating rigorous womenswear for the ladies-who-lunch. He still caters to that crowd but nowadays it is informed by casual sensibilities. Here, he combined his Resort and ready-to-wear shows. Early next week he will present his GREY Jason Wu diffusion line. His fragrance arrived with show invitations. Wu is centred on becoming the next Michael Kors or Ralph Lauren. All the power to him. Laura Kim and Fernando Garcia at Monse were somewhat more socially aware than Wu, thinking about their national pride. Having separated the show from their Oscar de la Renta endeavour, which presents Monday at Sotheby’s, they transformed their show space into a basketball court for a collegiate-inspired outing. The catwalk was stamped with a university-like seal. The clothes reflected the collegiate theme but weren’t too literal, thankfully. 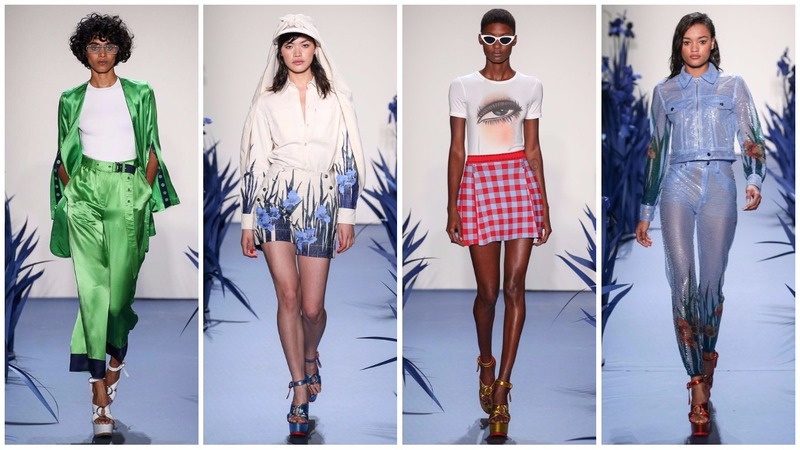 A vast improvement on last season, the clothes captured the brand’s spirit: it’s youthful with elegant brushstrokes. There was red, white and blue; stars and stripes; riffs on American workwear and sportswear. 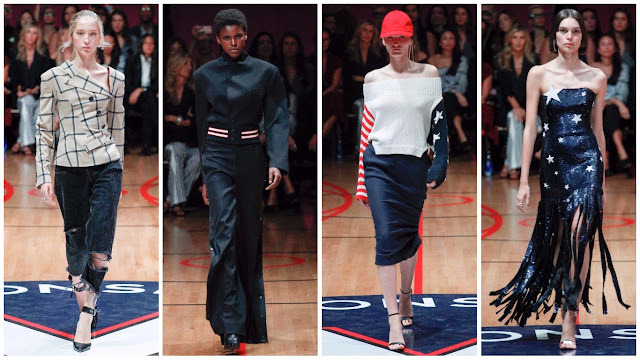 It was replete with Americana references and one appreciated the almost satirical element of perversion in some looks; for example, an abstract American flag sweater with a red baseball cap, resemblant of Trump’s Make America Great Again presidential campaign merchandise. The set design at this show may have been planned months ago, the collection coming together in the past four weeks—one cannot ignore the prescience of it. Education Secretary Betsy DeVos is currently trying to rescind Title IX protection for sexual assault survivors on campus or in schools—endangering educational environments, an egregious attack on liberty. The message Kim and Garcia were hoping to propagate was one of hope, optimism. It’s hard to be optimistic nowadays but at least there were efforts in this collection to show they at least cared. Brandon Maxwell has been a champion of diverse casting, representing America of today rather than yesterday—this isn't the case with many of his peers who whitewash their runways, notably. His Spring outing showed progression. He left behind the black and white staples that were his claim to fame. Fuchsia! Raspberry! Lemon! Scarlet! Cobalt! There was denim aplenty: new developments. His colouration was a bold move but perhaps he pushed the boat out too far, and it overturned. It was ersatz American glamour, a level of skill procured by his contemporaries at Monse. In conclusion, the most political this got is that one could easily imagine Melania Trump wearing it. Adam Selman, on Thursday night, talked about the notion of celebrating America and embracing its culture. He referenced a recent exhibition of Georgia O’Keeffe’s work at the Brooklyn Museum. There was some red, white and blue; denim; and Old Hollywood-inspired garments. Speaking about politics was rather redundant seeing as the collection had nothing to do with it. It was much more glamorous than usual, inspired by the merge between high society gatherings and underground raves. One can’t say it worked. A pregnant woman, artists, actresses and Kelela on the runway? Where else other than at Mike Eckhaus and Zoe Latta’s fifth Eckhaus Latta on-schedule presentation at fashion week. There haven’t been designers as progressive with casting as with this bi-coastal duo who represent people from all different backgrounds—a mixture of gender, race, age, physicality, is accounted for in their presentation. Their latest showing, in Bushwick, was their most refined to date. Now that they have a store opened in LA and worldwide stockists have proliferated, it is imperative for the duo to present some more commercially-inclined pieces amidst the usual idiosyncratic garb which exists in the wonderfully weird world of emerging New York talent. The cut of their trousers is unmistakably modern, informed by the past. There is a shapelessness to some pieces and one registers it as modern for it is down to the model to carry the piece. (It sits perfectly in the post-gender arena, a world distant from our own which is riled about during gender talks.) 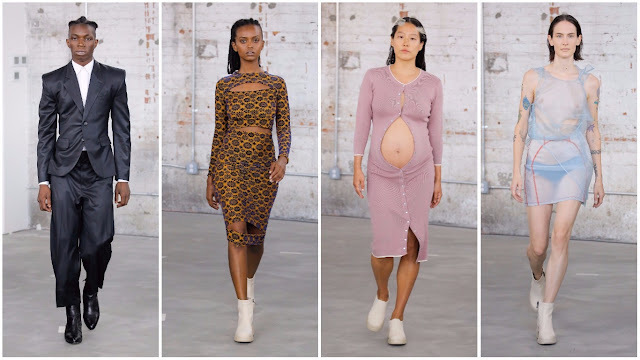 Artist Maia Ruth Lee, heavily pregnant, boasted her burgeoning bump in an open-stomach lilac cardigan dress; low-slung “bumster” jeans and revealing cloudy organza tops. The use of opaque fabrics was fascinating. Perhaps they were thinking about censorship. This critic was certainly, imagining the garments’ opacity as a metaphor for America’s current stance and aversion to free speech, governmental surveillance schemes and the inherent problematic nature of censorship. The designers may not have intended for their clothing to be read politically, but they undoubtedly belong in these times. There’s power in talking politics.